Okay it's been some years since I've had an album but I just got a Fotki. Are they the most flattering shots? No. But now y'all know what my hair looks like for reference. Enjoy! oooh, i love your hair! i think our texture is kind of similar. how long have you been natural? You, your hair and your smile are gorgeous. I will be looking for more updates. Love your hair, beautiful! How long have you been natural? It's good to finally see your hair, and it's gorgeous!!! I can't wait for updates. I went natural a few months after you, but since then I relaxed again and now letting it grow back out. So, I obviously have hair envy now, but your hair looks great. Products I can depend on: Elucence MBC and generic PM the Conditioner! 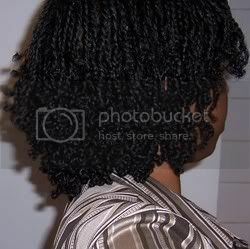 I got my last relaxer in October 2001, transitioned for a few months and did the big chop in May 2002. I think you might be my hair twin. But I will have to wait two more years to get that length. Our curl patterns are very similar.